NEW SONGS: Wrote Happy New Year for my CUJAM ukies, and got them singing it with me the first Wednesday back after the Christmas break. 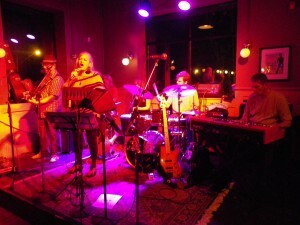 Co-wrote a song with Ilana Waldston – The Whatchamahoozit Blues. Ilana is a lot of fun, with some zany lyrical ideas. I crafted the music and arrangement and a lot of the lyrics. Lost in Rosedale was written after my one-woman show in July, when I got rained upon very badly on the way home. Cut through Rosedale to get back home, and got very VERY lost as I drove around for nearly 30 minutes until I found someone who could let me know how to escape the vortex. Check it out: Lost in Rosedale (cut#7) . If you scroll further down, you’ll find The Whatchamahoozit Blues with me singing it. SOLO PERFORMANCES: Winterfolk – I performed in a Song Circle with fellow songwriters from Songwriters Unite during Winterfolk – this year for the first time at the Delta-Chelsea Inn. Guested with the Uptown Swing Band at the Gallery Cafe in Etobicoke – fun getting back to my “big band chick singer” roots. Songs of the 60’s at Dominion on Queen: Performed songs by Bachrach/David; Ray Charles and many more – with the able backing of the great Bill King on keys, Russ Bosswell on bass and Daniel Barnes on drums. Betty Richardson, Colina Phillips and Mary Ellen Moore got up to do BG’s in Aretha’s “Respect” and brought the house down!! What a wonderful gig this was – so many people came out to hear some good music, and wish me a happy birthday in May. 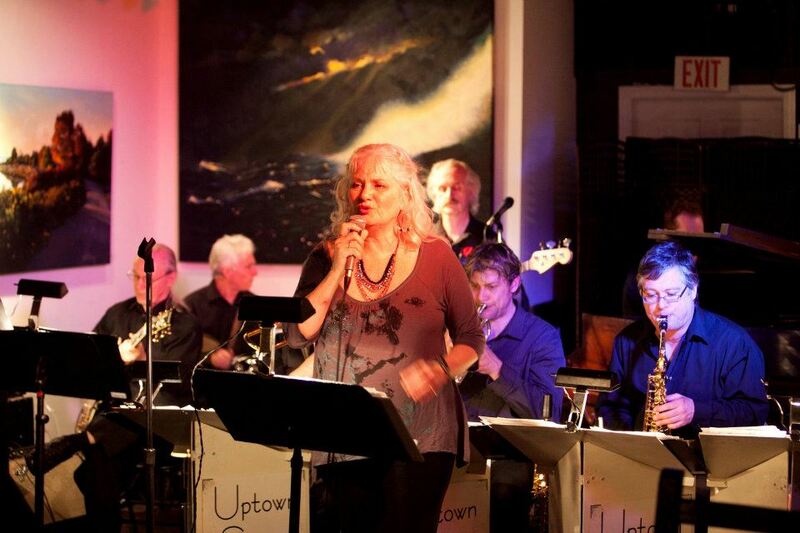 Debbie sings with the Niagara Rhythm Section on May 19, 2012 – with Steve Grisbrook, Penner McKay and Sandra Marynissen on percussion, David Norris on drums, Steve Goldberger on bass, and Rodger Niznik on keys. Niagara Rhythm Section, May 19th: Guested with this fabulous band at The Old Winery, and we rocked our tushies off! One of the best nights yet with this ensemble! 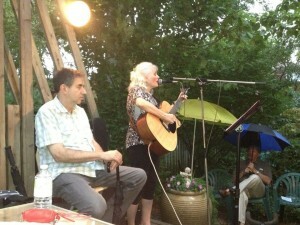 It was a rainy night for Debbie’s first one-woman show at The Artists’ Garden, for the Plein Air series. Sam Broverman sits onstage under the canopy, and Al Mair sits in the front row under a brolly. Garden run by Susan Brown. 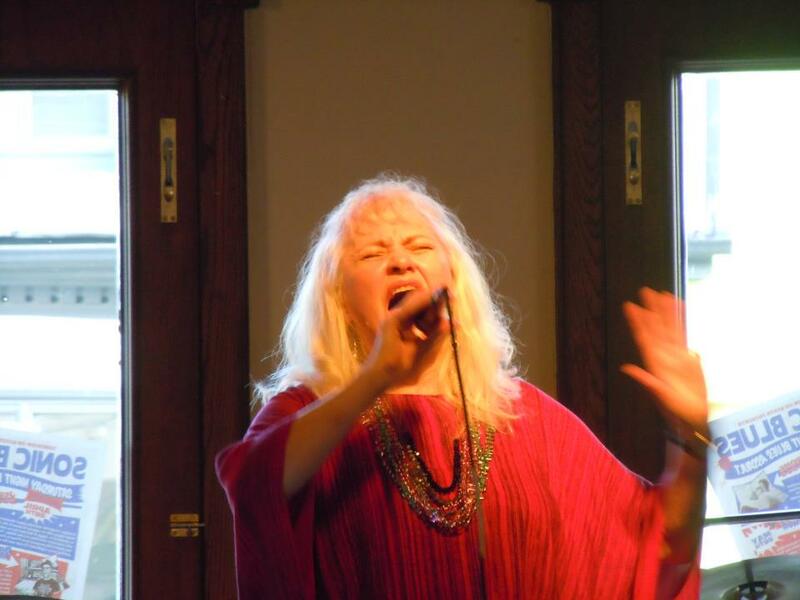 I was part of the Plein Air series, and performed everything from Elvis to my own songs. Singing and playing by yourself without a band is very different from what I’m used to – but something to continue honing! It was a rainy night, but my audience sat under brollies, or onstage with me until the bitter end. As we packed up – God decided to let’er rip, and the rain came down in buckets thereafter. And THAT is when I got lost in Rosedale on the way home. 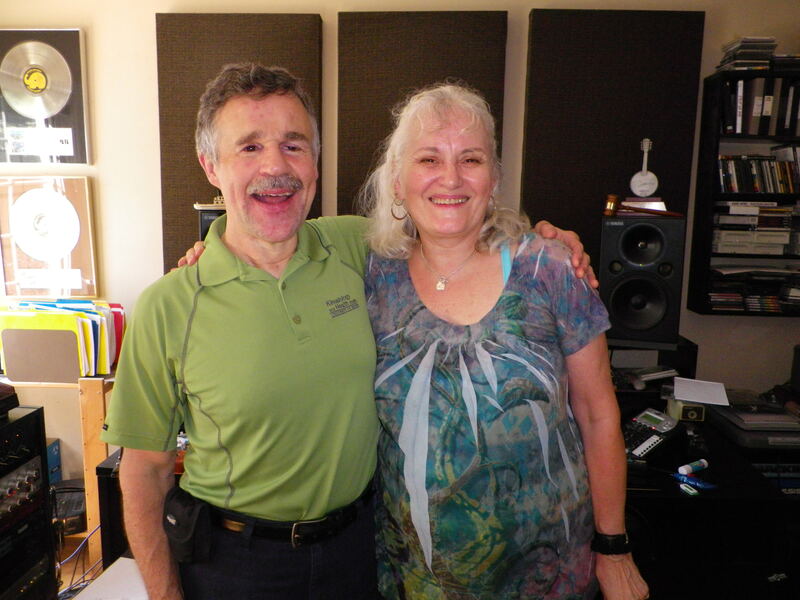 Terry Kelly and Debbie in the control room at Millstream – just after recording the BG’s for Terry’s wonderful CD, containing beautiful songs in the theme of war. RECORDINGS: Sang backup vocals on Terry Kelly’s new recording project, produced by Paul Mills at The Millstream. 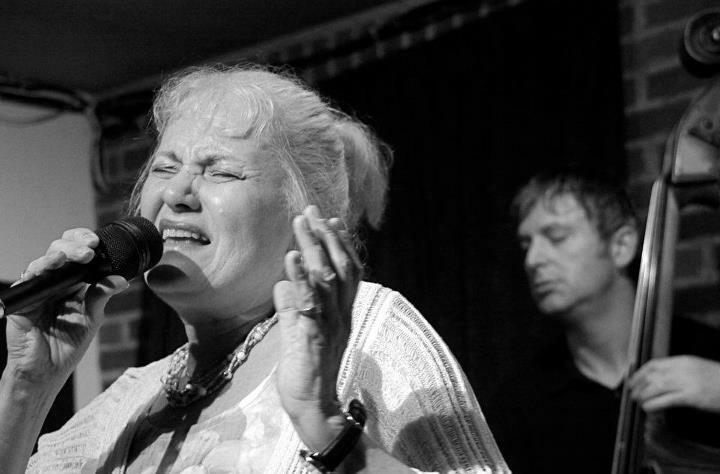 JAMGRIA – A new open-mic Jam has opened in the east end of Toronto, helmed by Pat Murray, and featuring a stellar trio of musicians every week, ready to back up any singer or instrumentalist who wants to sit in. Here’s a photo Bill Taylor took of me on the first night of this great jam. Debbie sings on the first Jamgria evening, backed by Artie Roth and Mark Kieswetter(unshown).